If you missed getting the 2018 Bailgun Notebook-Calendar you can download a version for your wall here. Just print it out and hang it on the wall of choice. To download just click on the picture and save it to your desktop. November 2018 – Steve Bailey Smith grind at a backyard spot in Hemet, Ca. September 2018 – Jo Haist, lien air at Hans`OMSA Pool. August 2018 – Max Schaaf, stalefish at Verkeley Ramp. July 2018 – Emilio Fernamdez, frontside rock at a San Diego DIY spot. June 2018 – Brandon Perelson, bs, square pool, Baja. Mai 2018 – Lincoln Ueda, tweak air at the B-Team ramp in Vista, Ca. 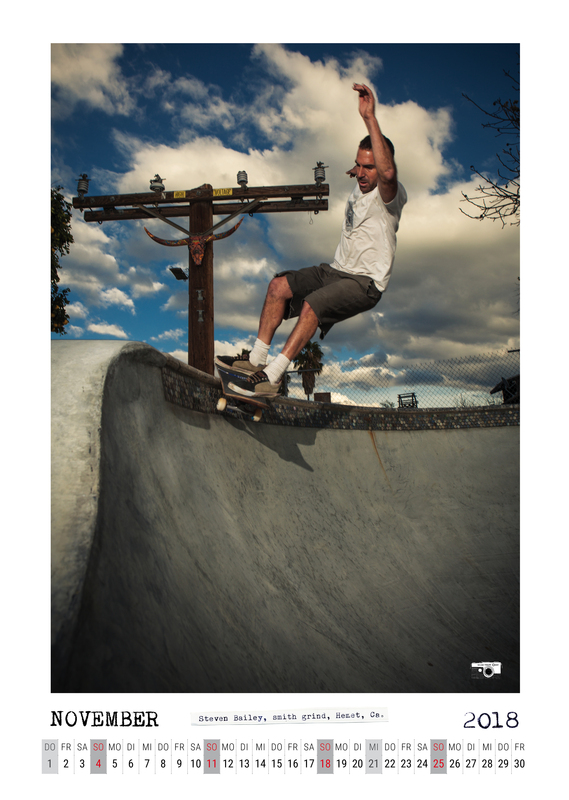 April 2018 – Zach Cusano, tailtap on the hip of the huge deepend at Arvarda skatepark, Co.